This project was initially intended to run in parallel with work to the Museum at the top of the site for English Heritage but the presence of a colony of Natterer’s bats here delayed commencement of work on this building. 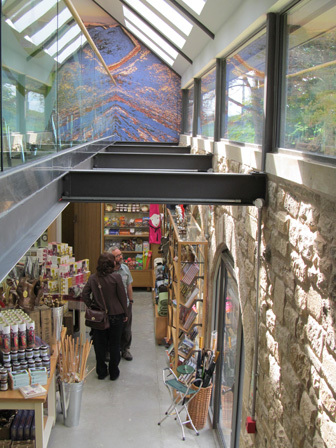 The existing Visitor Centre no longer met the expectations of the National Trust as the main point of arrival to this World Heritage site. The brief required extension to the existing accommodation and improvement generally to the visitor experience and facilities on offer. Extension of the footprint of the building was complicated by the archaeological sensitivity of the site. Introduction of a mezzanine floor required the raising of the roof over one wing of the building. 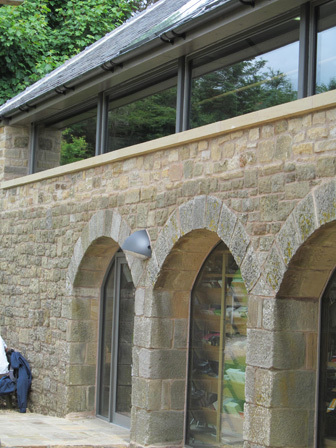 This provided extra space for an improved seating area for visitors and school parties with far-reaching views across the landscape beyond. This provided more space at ground floor level for improved interpretation, retail facilities and welcome.